“Laura Duncan is one of the most funny people I know. She is an amazingly hard worker, but at the same time she is a goofball. Cracking jokes is hilarious when it comes to my mom! Oh yeah – and climbing is her middle name. 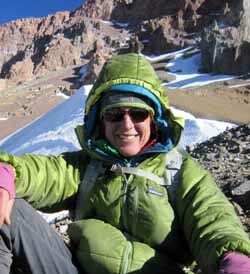 She has climbed Denali and Aconcagua working for Mountain Trip, most of all she loves spending time with her number 1 priority – her family!